Max loved them like a homesickness, all of him aching for an Avalon of his own. Morgan sat in front of him. He’d told her once that he pictured her more like a Guinnevere than a Morgan Le Fay. In his imagining Guinevere was always fair and light eyed, and the witch who was Morgan’s namesake more red-toned, with her hair and mouth the color of rust. Morgan had rolled her pale eyes at him. “You’re drunk.” True, he had been drunk, but Max also knew he was saying something important, only in a language no one else in the room understood. It meant everything to him that she was his Guinnevere and James was his Arthur, so that he, Max, might be Lancelot, beloved of them both. There was something more here. There was something mythic here, noble and eternal and pure, and he wanted to tell them so. He wanted to tell them that the books he loved as a child had made promises to him, that the world was beautiful and magical and in adolescence his heart broke when he resigned himself to the mundane. Now, on the cusp of adulthood, the world seemed magic again, and it was because of them that this was so. He opened his mouth to explain himself, but just then James kissed him and his desire to speak fell away. Time with the two of them always rendered him dumb. Max stood behind her. He watched Morgan’s reflection move in the mirror propped against the wall. Their room was covered in mirrors, hanging and leaning, swelling into an arch above Morgan’s vanity. They made Max feel disoriented. He never got used to seeing himself as a shadow trapped indiscreetly between the glass and the backing. In that room wherever he turned he saw his reflection like a moth pinned within a display case, still alive and violated and moving. She knelt. She seemed to be sorting something on the floor. Her hands fluttered from the carpet to the frame of the mirror and then back again. “What are those?” Where her hands had been she left small gold shapes along the wood of the frame. “They’re cicada shells,” she said, “I collected them on a walk we took earlier, when we went down to see the lake. I always used to pick them up as a kid. They’re so beautiful.” Max had never seen a cicada shell before. He’d grown up in the city and saw nature as something that existed elsewhere. This made Morgan laugh. “Haven’t you ever wondered what that moaning sound was in the summer?” James’ drawl preceded him out of the bed behind them. He’d spent his childhood in Alabama and had told Max stories of swamp monsters much stranger than cicadas. “Here,” said Morgan, and extended her hand out towards Max. “Hold one.” Max let her place the insect in his palm. The cicada was gold and delicate. The creature’s fine legs were sharp against his skin. It felt as though it might pinch him. It felt as though it was hanging on. “How can you be sure they’re empty?” Max watched Morgan finish placing the cicadas along the frame. She got up and took his hand. “I’m sure. Let’s get back in bed,” she said. James rolled onto his side to make room. Max let her lead him. He sunk into the feeling of their hands on his body. They moved around him, James’ hands down his back, Morgan’s hands down his pants. Then her mouth was on his mouth and his mouth was on his neck and James was pulling off his pants and Max was inside her, and he was inside him, and Max was panting and and aching and alive. He had only ever done this with them, James was the only man who’d ever fucked him and Morgan the only woman who’d ever mattered like this, who’d held his head to her chest and kissed his hair as he shifted from someone who hadn’t to someone who had. Each time was better than the time before. Whatever they were was ripening. Max arched and moaned. He couldn’t help looking back towards the mirrors to watch their bodies writhe within their surfaces. The King and the Queen and their knight are moving towards a vast and mutual ecstasy. The shadows were lengthening in the afternoon light. Beneath the pant of Max’s breath there was a whirring sound that came from outside and seemed to grow louder and louder. Along the sides of the mirror, he could have sworn he saw the cicadas begin to move. Lancelot dismounted and watched Arthur silhouetted against the violet sand. The King’s horse was limping. All around them the wind crackled electric. Heat lightning broke over the horizon as the troubled desert came to rest after a rainless storm. “I know.” Lancelot lead his horse to where the Arthur’s mount stood wheezing in the dryness. He reached his chapped hand up toward the King. “We’ll find a dragon someday, along some other path. But we’ll need to make camp before nightfall.” The King kissed his palm. “We’ll go there then,” said Lancelot, “but first we make camp. And perhaps before the ogres we ought to head home.” He helped Arthur from his horse. They began to walk back the same way they’d come. The sand sunk under their heavy boots. With each step forward the earth beneath them shifted. Lancelot tread carefully. It felt like the ground might give way. They must have seemed so small as they passed beneath the battlements. Lancelot looked up to where he knew she would be waiting, watching them ride in through the gates. He imagined he saw a flash of bright hair and silver skin before the gate opened before them and they were within the city. At the stables several boys emerged from where they stole naps in the sun-warmed straw and began to care for the tired horses. Lancelot was lost within himself, imagining his quarters, imagining bathing and then dressing in clothes that weren’t weighed down with sweat and dust. He’d clean himself up then come into court where she’d be with her women, and he’d watch secrets hang in the air between them before making himself known with a graceful bow. But then there she was. Guinevere's heavy skirts swirled the dust of the stable floor into a sunlit cloud around her. She moved towards them in a blur of mauve and gold. Then, as quickly as she’d come, she was in his arms. Arthur’s arms. Arthur pressed her into himself and kissed her perfect face over and over again. They were smiling, and they were beautiful. Lancelot knew she’d never come to him first. Of course he knew. He felt hot and strange for wishing otherwise. 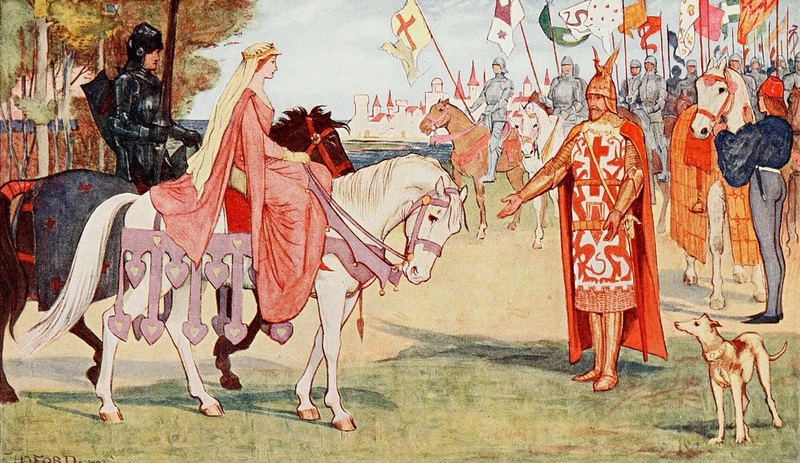 Guinevere broke her embrace with Arthur. “I missed you as well!” She greeted Lancelot with a chaste kiss. 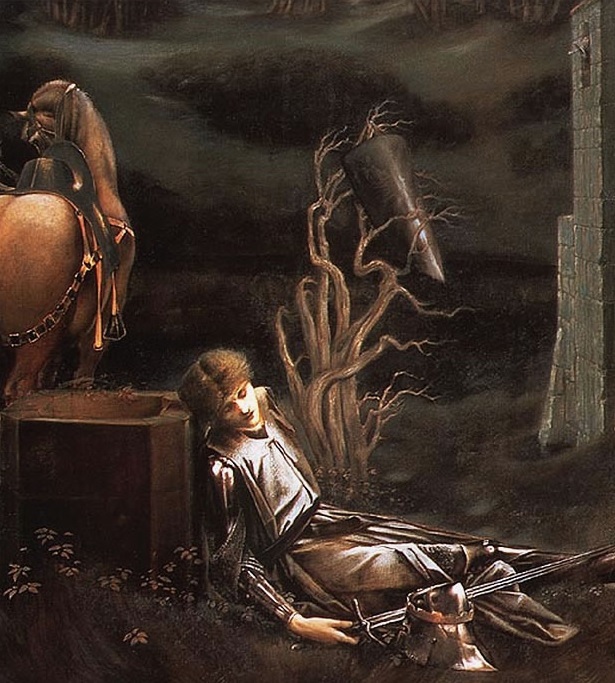 Lancelot lost his footing and shifted backwards out of her arms. He apologized. It had been a long journey and he was very tired. He turned to go but the King grasped his hand. “You’ll feast with us tonight? After you’ve had some rest?” Lancelot nodded. “And soon, those ogres in Gotaland! You’ll be with me?” Lancelot used his last ounce of strength to smile. There were as many ogres in Gotaland as there were dragons in that forsaken desert. All of Arthur’s monsters seemed to fade into mist as the King and knight approached, leaving them in far away places with no company but each other and no one for miles to see them. Each beast was an excuse for them to be alone. Lancelot didn’t want to run through the woods after ghosts, he wanted to be in his arms, in her arms, in something intimate and secure and sacred. He succumbed to Arthur’s fantasies. When Arthur mentioned monsters, all Lancelot could say was yes. When the King asked him to dinner, and Lancelot said yes. When the King asked him to come away with him, Lancelot said yes. The lights on the dancefloor were disorienting. The music felt heavy and dull. Max was still exhausted from the night before. He thought this was what it might be like to be in a womb, throbbing and hot and damp. Everything in the dance club was sticky. They danced together, the three of them moving in the half-dark. Morgan whirled away to dance among a group of women Max didn’t recognize. She seemed to know them, or maybe that’s just how women were, one moment strangers and the next moment in love with each other in ways Max didn’t understand. He and James paused to watch her dance for a moment and then moved off. A piece of the crowd seemed to give way for James and he placed himself on a now-vacant barstool. Despite the deafening music and the calls from others waiting for drinks the bartender appeared in front of them in an instant as if he were somehow summoned. James ordered two whiskeys, nice ones, without asking Max what he wanted. Max didn’t want whiskey. He never had, but that’s what James drank and so that’s what Max drank when he was around the couple. He had learned to tighten his lips to keep himself from wincing. “She’s beautiful.” James' eyes followed Morgan across the room. “I suppose you could. Or you can stay and we can just get back to dancing.” James tried to kiss him. Lancelot kneels before Arthur to hear him order Guinnevere to the stake and with her sentencing the knight himself is condemned. He’s planning her rescue. He is going to save her from the cruel and aging King. Max turned away from James’ mouth and wove back through the bodies to where Morgan was dancing. Max kissed her, harder than usual, longer than usual, feeling James’ eyes burn against his back. “Hey handsome,” she said, “where’s James?” Back at the bar James was leaning close to a redhead in a short dress and tall boots. Morgan lit up. “God, look at her.” She winked at Max. He watched her slink up to the girl and say something that made her laugh. Morgan brushed hand along her high leather boot. Max pushed through the crowd that just a minute before seemed to give way for easily, but now became a strange and swaying wall. He ran past the other men in line for the bathroom and someone shouted “Hey!” and someone else shouted “Let the guy through he’s gonna barf!” Max felt himself get hot with shame. He made it to the stickered and sticky bathroom stall, fell to his knees and vomited. Everything that came up tasted like whiskey. He heaved. He was replaceable. Four sharp pomegranate kernels caught in his mouth. As he left the bathroom a girl with pitying eyes handed him a mint. James and Morgan were dancing. In the dappled light they looked so beautiful, so in love, that Max wished he was either of them, it didn’t matter which, tangled up in the other in the artificial glow. Jealousy burrowed its way into the lining of his stomach. He wished he could fall through the floor. Instead he moved towards them. Morgan reached out to pull him between them. Surrounded by their breathless, sweating bodies Max felt the full brutality of heaven. He began to move, faster and faster and faster, wild and spinning and nauseous. “Please.” Lancelot’s eyes were wide and hungry. “I fear the only ogre he’ll find is me.” Lancelot was suddenly exhausted. He curled into the queen’s bed. She lay beside him and ran her long fingers through his hair. Max wasn’t going to go home with them. If he didn’t mean anything to them he was just going to leave. But they lived close to the club, and they were both so beautiful, and Max was drunk. Max found himself walking towards their apartment, arm in arm with James and watching Morgan’s slight form pass in and out of streetlights in front of them. James gripped his hand too tightly. Morgan, who might still love him, was half way out of sight. Lancelot left the Queen’s bed and returned to his quarters. It was early morning. He began to change in the dark. Every article of clothing he put on was meant for traveling, meant for adventures like this, and every piece felt like a shackle. He took a piece of parchment from his drawer and wrote the words “I love you. Farewell.” He returned to the Queens room and slipped it under the door. In the stables Arthur was already waiting. In the cool dawn, the horses’ breath came like a heavy mist. James and Morgan were asleep when Max heard the noise. Max was watching her face in the near darkness, listening to her breath, as if her dreaming body might betray what she would say if he swore he loved her. In the heavy quiet of their bedroom the faintest sound of cracking began to come from the wall. He thought he was imagining things. He tried to fall asleep. The cracking sound continued. Then a little shuddery noise, a buzz. He began to feel afraid. Max turned on a light. Morgan moaned and James murmured “What the hell?” But the words were swallowed up by the sound of screaming. All around them the air was alive. Max was shouting something over and over. “They’ve hatched!” The cicada shells had not been empty. In the night the insects had shaken off their exoskeletons and dried their wings in the cool and the dark and now around them the room was howling. Their flight seemed impossibly fast, fast enough to multiply each of the dozen creatures into a hoard, until it felt like thousands of insects filled the room. Their bodies were bright and heavy like jewels. They slammed into the mirrors around the room with a shriek and a thud and then rose into the air again, dizzy and reckless and crying. Max shrieked, “It was supposed to be empty! You said they were empty!” Morgan mouthed something like “I’m sorry” as she watched the monsters pound against the walls. She sat in a stunned daze. James was beating them down with his hands. Where the insects fell they moved against the floor in circles before flipping their dense bodies upright and taking flight again. Max threw on his clothing in a tangle. One of the cicadas hit his shoulder in a wild dash towards the window and Max shrieked and it sounded like a sob. A cicada was tangling itself in Morgan’s blond hair. Max snatched at the insect, too hard and too fast, crushing it into her tangled curl. Morgan pulled back sharply but Max didn’t let go. “Get off her!” James knocked Max to the floor. “I’m sorry, I’m so sorry.” Max’s voice broke. Max was breaking down. “I love you,” he said. For a moment it seemed the insects fell silent. “We love you. Don’t you see that?” Morgan looked close to tears. She tried to brush the shining pieces of exoskeleton from her hair with her fingers. One translucent wing stuck above her eyebrow. James said, “I think you should go.” The dying King drags his own corpse along the length of the usurper’s spear to slash at his throat and they fall to the earth in unison. Max slammed the door of the bedroom shut behind him, keeping James and Morgan and the screaming things from following him out into the night. He jammed his feet into his shoes and ran from their home, falling down the concrete steps in the front of the building, running though now his knee was bleeding and he had nowhere to go. Finally, far from the room and anywhere he recognized, he sat on the curb and tried to catch his breath. All he’d ever wanted was something magical to happen to him. An insect crawled upwards along the back of his jacket. The moon was cold and distant. Max held his body close. In the dark of the morning, he felt himself shake, and shake, and then grow still. Arthur turned and stalked into the cave. All Lancelot could do was follow. The cave was like any other they’d entered seeking some beast, dripping with dirty water and echoing with the sound of their breath. The path became increasingly narrow. Their bodies were pressed close. “I never lied to you,” Arthur whispered. His words reflected off the stones and came back like thousands of small voices hissing all at one. “It isn’t empty at all.” The narrow passage gave way into an open cavern. A shaft of sunlight broke through a large crack at the back of the cave, warming the rocks below. Before them everything they were seeking lay curled and dangerous and breathing. Its body was red and gold and heavily scaled. A ribbon of smoke rose into air from it’s large, arched nostrils. Lancelot made a strangled sound. The creature began to stir. It inhaled. The earth shifted beneath him. The dragon opened its eyes. Audrey Fierberg is a recent graduate of Brown University and is working towards her MFA in Fiction at Northwestern University. She lives in Chicago with her cat and her toad. I keep a small notebook called “the object journal.” It isn’t filled plot ideas, but objects and images, things I see out in the world. In this notebook a fox I once saw playing with a struggling mouse in the grass sits next to a description of my neighbor’s tribal butterfly lower back tattoo, visible when she bends to lift her child into his car seat. In goes a line overheard of conversation, the tilt in a dear friend’s shoulders, the swallows that nest under the docks along the lake. When I sit down to begin something new, I look at this hoard of notes and see what images seem to be talking to each other, what objects want to inhabit the same space. I arrange the little things I’ve collected into the skeleton of a story.